Bacteriophages, like all viruses, are extremely simple in structure. They consist of a small piece of genetic material contained within a protein capsule and are incapable of self-replication. Instead, in an act of genetic subterfuge, bacteriophages inject their genetic material into a bacterial cell where it is replicated by the bacteria’s cellular machinery as if it had always been there. Bacteriophages can be easily manipulated in a laboratory setting due to their structural simplicity. Indeed, one of this year’s laureates for the Nobel Prize in Chemistry, George P. Smith, took advantage of this trait to achieve a remarkable feat in molecular manipulation. Smith demonstrated that bacteriophages could be utilised to discover the unidentified genes associated with known proteins. Candidate genes were inserted into bacteriophage genetic material in a region associated with surface structures and thus a small fraction of the resulting protein, known as a peptide, would be displayed on the surface of that bacteriophage cell. Smith carried out these experiments in bulk, creating a pool of multiple bacteriophages, each expressing one peptide associated with a gene of interest on its surface. To then identify these peptides, he made use of a natural phenomenon, namely antibody specificity. Antibodies, easily recognised by their distinctive Y-shape, are integral components of the immune system. Antibodies recognise and bind to structural components of invading pathogens such as bacteria or viruses and direct the immune system toward these invaders, leading to their neutralisation or destruction. This binding occurs due to the extreme specificity displayed by each antibody toward a certain protein on the surface of the pathogen. In a mixture of tens of thousands of proteins, an antibody will bind to its target protein with ease. Smith took advantage of this and probed his pool of peptide displaying bacteriophages with antibodies specific to known proteins of interest. 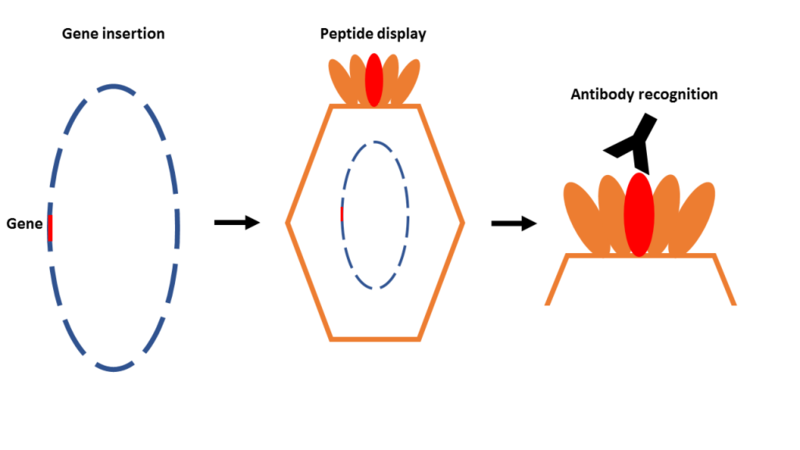 When an antibody bound to one of the peptides, that peptide was thus identified as a component of the specific target protein of that antibody and therefore the previously unknown gene had been identified as belonging to that protein. This process of utilising peptide display by bacteriophages to link genes to their resulting proteins, now known as phage display, became an integral method in genetic and biomolecular research and laid the foundations for many scientific breakthroughs. One of these breakthroughs was achieved by Smith’s co-laureate, Sir Gregory Winter.